“Mister, Mister,” a young man yelled at me as I left the bank. The man, dressed in a long robe and with a round hat that identified him as a faithful Muslim, was running toward me. I was already on edge. 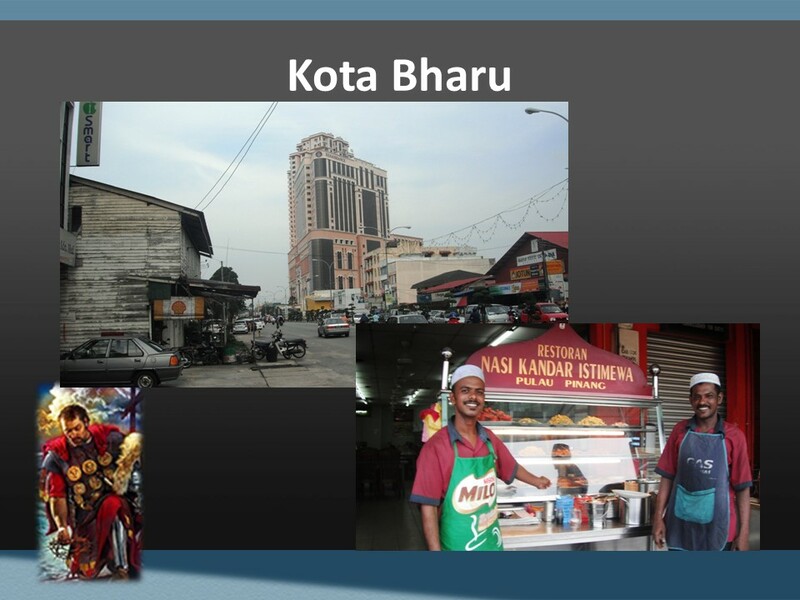 This Kota Bharu, a city in northeast Malaysia, which is predominantly Muslim. “What does this guy want?” I worried, but there could be no avoiding him. 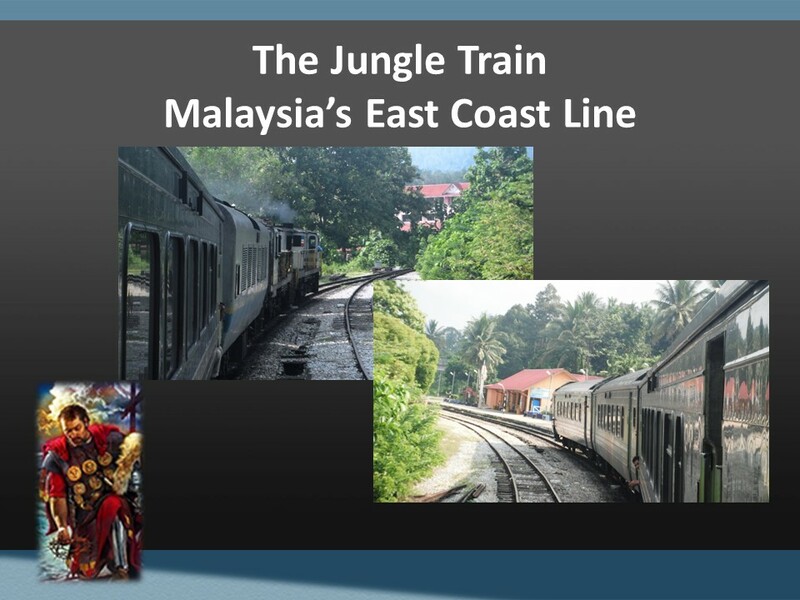 I had come to Kota Bharu because I wanted to ride a particular railroad, known as the Jungle Train. Few westerners take this train. The cars are not plush like the trains along the western coast of Malaysia, which runs through the Kuala Lumbur with its tall skyscrapers. This line runs on old track. The cars are rugged. There are holes in the upholstery and some seats have springs showing. The air conditioning barely works. The train is pulled by diesel locomotives purchased second-hand from India, Japan and other countries. I learned this creates a problem with maintenance as there are few interchangeable parts. The trains are slow. But what do you expect with old equipment on a line that runs through mountains and stops at every junction and path along the way? There’s not even a dining car on the train, just an attendant selling a limited selection of chips and bottle water. I suggest if you take this train, you pack a lunch. It’s a 15 hour ride from Singapore to Kota Bhura. Although this is no tourist train, the scenery is incredible. There are no large towns along the line, until you get to the end. Just small villages, beautiful mountains, and in the distance one of the largest waterfall in Asia. If you’re a military history buff, Kota Bhura was the site of the Japanese invasion that caught the British by surprised in World War II. The attack occurred on the night of December 8, 1941. Think about this for a moment, this being a weekend in which we remember those who died in the service of our country. Being on the other side of the International Date Line, the attack on Kota Bhura occurred on the same day and close to the same hour as the attack on Pearl Harbor and a host of other attacks. Pearl Harbor, because it was ours and because of the amount of death and destruction, overshadows the significance of the Japanese invasion of British Malaysia. Once the Japanese landed, they made their way south, along this rail line. Their ultimate objective was Singapore, which they captured two months later. Today, the northeastern part of Malaysia is populated by very conservative Muslims. This was evident when I arrived, as there were few women seen on the streets while many of the men wore long robes and hats. This made me a little uncomfortable, as with this guy chasing me down in the front of the bank. I’d gotten off the train in a downpour. When the rain let up, as I was trying to find a room, I could hear the crowds yell as a speaker was heard throughout the streets. I assumed this was from a mosque. It’s not uncommon in that part of the world to have the sermons heard on loudspeakers throughout the city (I wonder how that might go over here in the Landings?). The cheering had me worried; I was the imam calling for an intifada or jihad. Might I be a target? I turned around and tried to look tall as the young man approached. Then he held out his hand and presented me with the debit card with which I had just withdrawn funds. I was humbled. I had thought I had slipped it into my money belt in my pants, but had missed. It had fallen through my pants and onto the floor. I didn’t even know it was missing. This man I feared had saved my day. Furthermore, I later learned from a waiter in a restaurant who spoke English that the excitement pouring out of the speakers wasn’t from a mosque. It was from the football stadium (or what we’d call soccer). The Malaysian national team was playing Myanmar. A lesson that I learned that day is that our first impressions are often wrong. As the Book of Hebrews reminds us, sometimes strangers turn out to be angels. 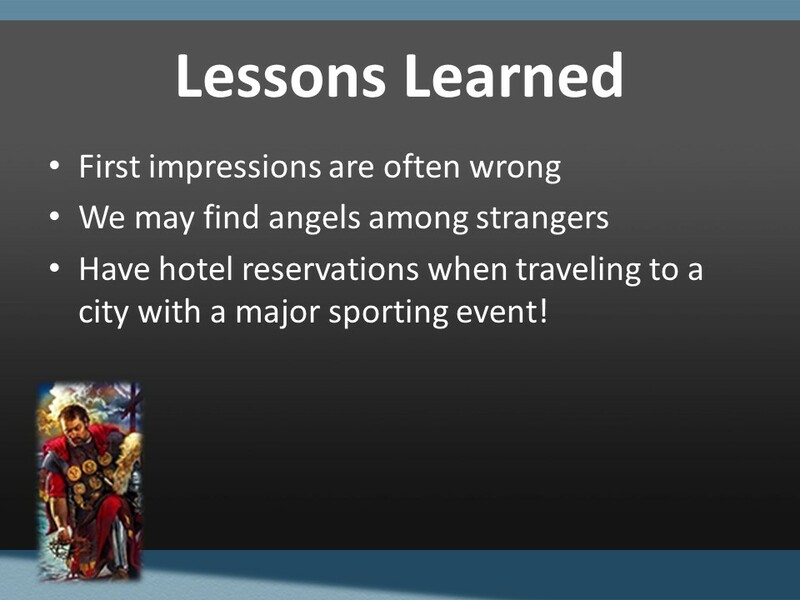 A second lesson learned was that if there was a big sporting event in town, you should have hotel reservations as I ended up paying a lot of money (especially for that part of the world), to stay in a dump. But it was the only room I could find. 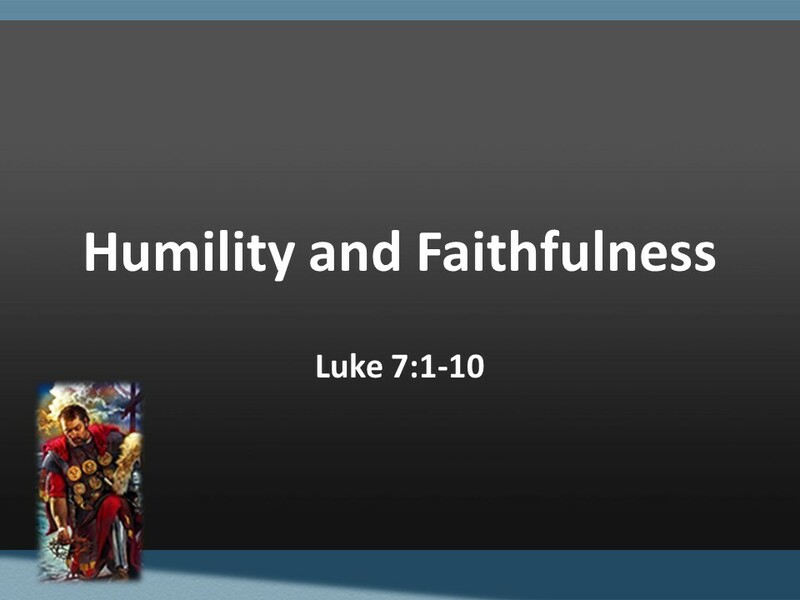 Our passage for today’s sermon is from the seventh chapter of Luke’s gospel. Kind of like my experiences, this is a story of a cross-cultural interaction. We have a Roman soldier interacting with the Jews he was to control. However, this man did not look down on those under his watch, but did what he could to make their lives better. Like the story of the Good Samaritan, we learn the religious are not necessarily the good guys. There are lessons we can learn from this story, too. Read Luke 7:1-10. What do we need to do in order to experience Christ’s blessings? In our story this morning, the Roman Centurion shows two necessary requirements: humility and faith in Christ. To what extend do we share these traits? The incident in this story comes on the heels of Jesus’ great sermon. In Luke, this is known as “The Sermon on the Plain.” Matthew’s gospel has a similar but more extensive sermon known as “The Sermon on the Mount.” Both Matthew and Luke place the story of the Centurion shortly after Jesus finishes this sermon which, in both cases, our Savior emphasizes the need to love one’s enemies. The requirement to love one’s enemies is quickly backed up with this example of such love. The Centurion is an enemy; he’s a representative of Rome. He’s a conqueror; he helps Rome’s puppet-kings, like Herod, rule Israel with an iron-fist. 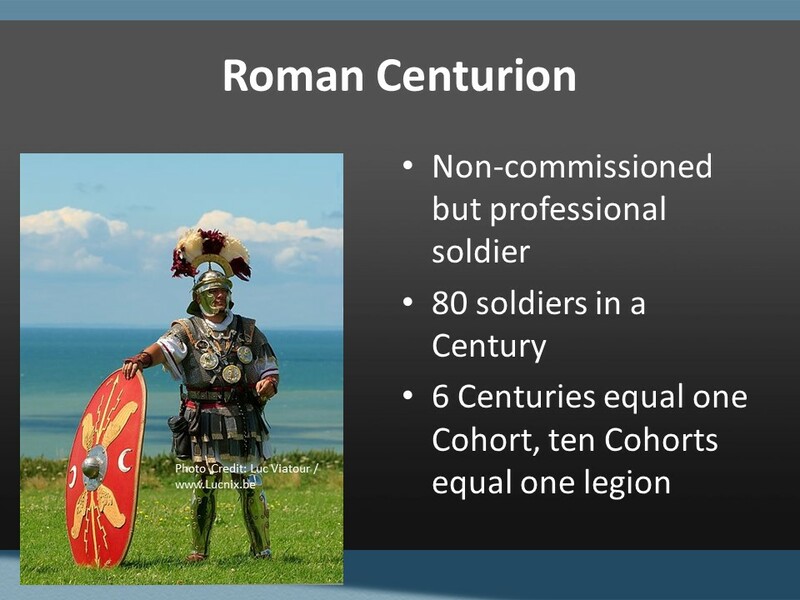 Centurions, in the Roman military organization, were non-commissioned but professional soldiers who had risen up through the ranks and were in charge of eighty soldiers, not the hundred soldiers as the name implies. In a Roman legion you’d have ten cohorts of 480 men, each cohort divided into six centuries. These men who led the centuries were the backbone of the army and were well paid. This Centurion had a servant or a slave whom he depended upon and was distraught that the slave was ill and near death. Obviously the man, who would have been a pagan, had heard of Jesus’ miracles and decides that his one chance to save his slave is to obtain Jesus’ favor. So he contacts the Jewish elders in his city, which he had helped when they were in need of a synagogue, and asked them if they would go to Jesus. In a classic case of “you scratch my back, I’ll scratch yours,” the elders agree and go to Jesus and speak highly of the Centurion. “He loves our people.” So Jesus heads off to the man’s house, but before he arrives, the Centurion who obviously feels unworthy sends another delegation to Jesus and tells him he doesn’t have to make a house call. They acknowledge the Centurion’s belief that Jesus has the power with his word to pronounce the man healed. 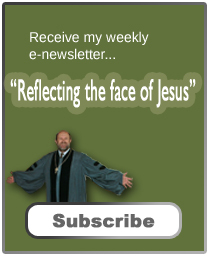 Jesus is amazed that this man, whom he’s not met, has such faith. Turning to the crowds, Jesus points out that his faith is greater than the faith of Israel. This statement by our Savior, I’m sure, was the cause of a few eye rolls and frowns from the Jewish leaders. Yet, without missing a beat, Jesus heals the slave. It appears Jesus never met the Centurion. There are a lot of lessons we can take from this passage. In the ancient church, Augustine noted that the Centurion’s actions show that one can serve God even as a soldier, something that had been debated in the early centuries of the faith. 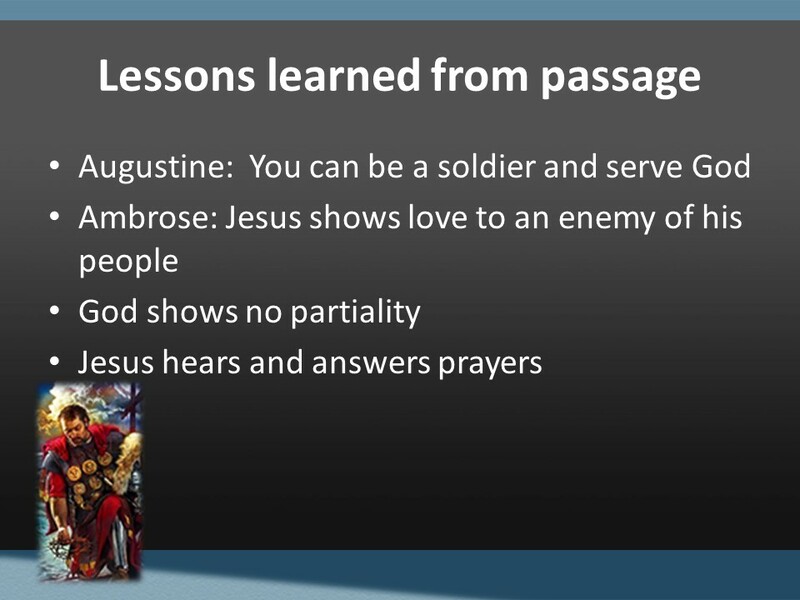 Ambrose, another 4th century theologian, noted the love Jesus shows for one who was an enemy of his people. Both are true today, but for most of us there is something deeper here. In Peter’s sermon to the Gentiles recorded in Acts 10, he begins proclaiming that God shows no partiality, and that all who fear God and do what is right is acceptable. Here, in the Centurion’s case, a man who may not even have met Jesus, a man who may have prayed in Pagan temples, finds his prayers answered. This is good news for us! We don’t have to be perfect in our faith for God to answer our prayers! We don’t have to first meet Jesus, face to face, to have him answer our prayers. Jesus hears and answers prayers from all and rewards humility. We get the sense in these few verses that the Centurion was a good man. Although not Jewish, he helped the Jews build a synagogue and undoubtedly did other things to ease the burden of oppression that came from having a foreign army ruling Israel. His love for others isn’t like that of Linus, in the Peanut comic strips. 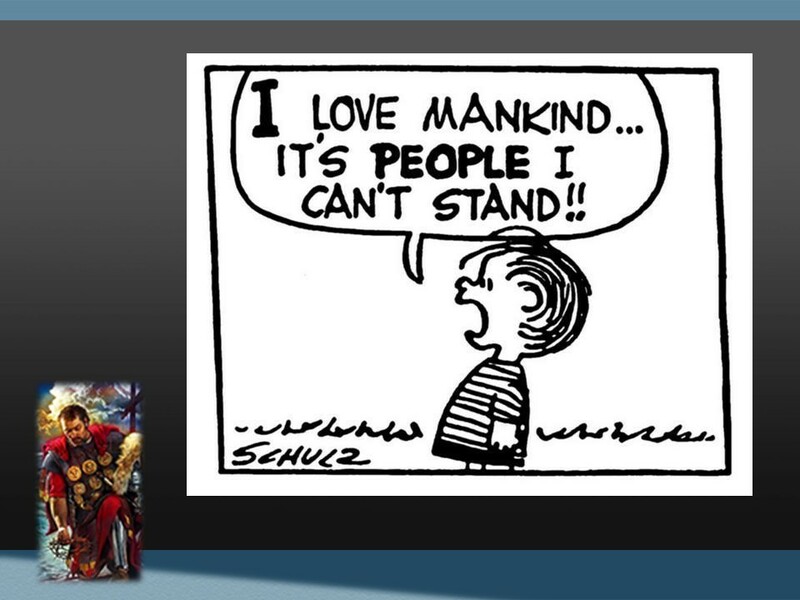 “I love mankind; its people I can’t stand,” Linus is known to say. This Centurion shows his love for even a slave, one who had no real standing in society. He shows his love by doing what he can to help others. In addition, even though he is a man with power and can order soldiers into battle, he is also humble and realizes that he, like us, is dependent on others. To get this job done, he has to call upon his Jewish friends and on Jesus. This is a wonderful story for it shows the advantages of friendship among those who are often considered enemies. It also shows us that God’s love is so great that we can’t (nor should we try) contain it. God will smile upon those he chooses and they may even be our enemies. Our purpose as Christians isn’t to lure God over to our side, but to be on God’s side. God loves the world, and we should, too. Before heading to Southeast Asia for the trip I mentioned earlier, I had coffee with a friend of mine from Michigan, who’d sailed around the world with his family. His anchor had given away one night in Australia, and the boat rammed a reef. He got the boat to Malaysia, where they lived for over a year, while it was being repaired. Gregg told me that from his experience, there will be people who would want to take advantage of you, but most people are good and want what is best for you. And although not all such people are Christian, this is a trait that we Christians are to live by. Jesus tells us we’re to love our neighbors as ourselves and we’re to pray for our enemies, even for those who persecute us. This holiday weekend, take time to reflect on your life. Ask yourself: Do I come before God with the faith and humility of the Centurion? Do we love those who are different from us in the way that God loves them? If not, confess your sin to God, asking the Almighty to soften your heart and to help you see the world through Jesus’ eyes. Amen. Norval Geldenhuys, The Gospel of Luke: The New International Commentary on the New Testament (Grand Rapids: Eerdmans, 1983), 220. David Kennedy, “Roman Army,” The Anchor Bible Dictionary, Vol. 5 (New York: Doubleday, 1992), 790. Augustine, letter 189, quoted in the Ancient Christian Commentary on Scripture, New Testament III: Luke Arthur A Just, Jr. Editor, (Drowers Grove, IL: IVP, 2003), 117. Ambrose, “Exposition of the Gospel of Luke” 5:83, Ibid, 115. See Gregg A. Granger, Sailing Faith: The Long Way Home (Middleville, MI: Gregg Granger, 2010).